Starz is probably the greatest “unheard of” hard rock band that sprang from America during the 1970s. They still plug into bars around the country to play in front of die hard fans that still haven’t given up on them. And if they came to a town near me, I’d be one of first people to purchase 4 tickets. I’ve never had the pleasure of seeing them, but I do know one person that saw them open for ZZ Top in Louisville, KY. I was bitterly jealous, but not because he got to see them… But because they recorded the show that he attended as part of a live radio station broadcast. There’s an exact (barring any overdubs) record of his concert experience. But I got over it and recently found that the deluxe release of Steve Earle’s ‘Copperhead Road’ has tracks recorded at a show that I attended in Raleigh, NC. And Blackberry Smoke released a live album recorded at a show at Ziggy’s in Winston-Salem that my wife and I attended. I love all four of the Starz releases on Capitol Records. 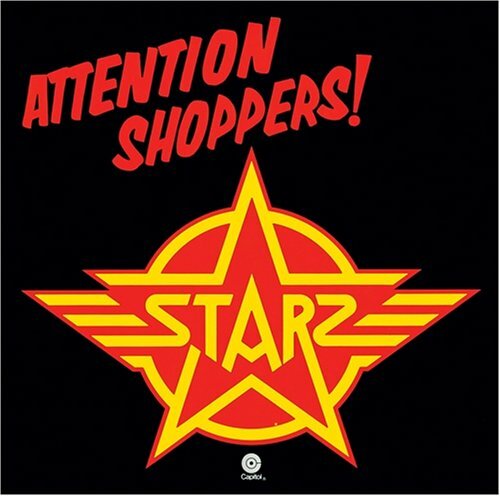 But the third release ‘Attention Shoppers’ finds the band pouring gasoline onto their power pop songwriting abilities. And in my opinion, it’s their best release. There are songs that can rattle your innards that will cause you to have a blissful regular start to your next day. Songs like “X-Ray Spex”, “Good Ale We Seek”, and “Waitin’ on You”. There’s the lumbering, lyrical story about “Johnny All Alone” that provides a great film noir stoyboard for your brain. The length of the song provides Richie Ranno plenty of room to compliment the lyrics with swaggering lead guitar that brushes in melody instead of flash. And the rest “Don’t Think”, “Hold on to the Night”, “She”, “(Anyway That You Want It) I’ll Be There”, and “Third Times the Charm” are just great power pop songs that deserve proper recognition. I believe those songs should have littered the rock radio landscape during all of 1978. “Third Times the Charm” is tune that could have walked all the way to number one on the Hot 100. No matter how you slice it, it’s the perfect recipe for popular song craft. Play "Third Times the Charm" the next time you’re at a place with a digital jukebox and watch members of the venue react to it. They may take it as a love song. Some may exhibit signs of sexual arousal when they are around their partner. There may be unavoidable cuddling. Starz paved the way and influenced the next generation of hard rock bands that gained overwhelming success during the 1980s. They created the Warrants, the Bon Jovis, and the Ratts. Unfortunately, the third album from Starz wasn’t the charm. They faded from the rock scene after the way too Boston-ish ‘Coliseum Rock’ album. ‘Coliseum Rock’ is a very misunderstood album and better suited for a different kind of list. Try ‘Attention Shoppers’. Allow yourself to crank it up and imagine that you’re a teenager leisurely driving over to a friend’s house in their bitchin’ Camaro. The windows are rolled down and it’s a comfortable day during the summer of 1978. That's the spirit of 'Attention Shoppers'.